Mount Roraima is also known as Tepuy Roraima and Cerro Roraima; is the highest of the Pakaraima chain of tepui plateaus in South America. 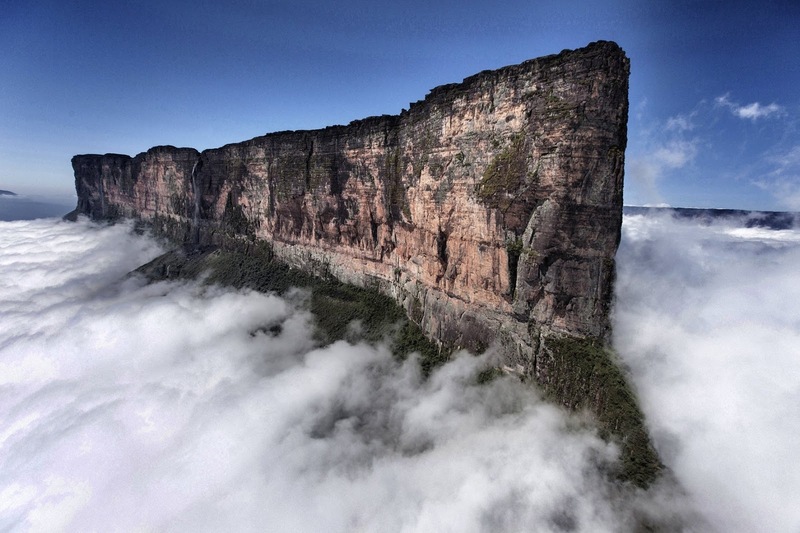 A mystic, flat-topped mountain on the Venezuela-Brazil border that mystified 19th-century explorers and inspired “The Lost World” novel is enticing ever more modern-day adventurers. In 1595, English explorer Sir Walter Raleigh first described during his expedition. 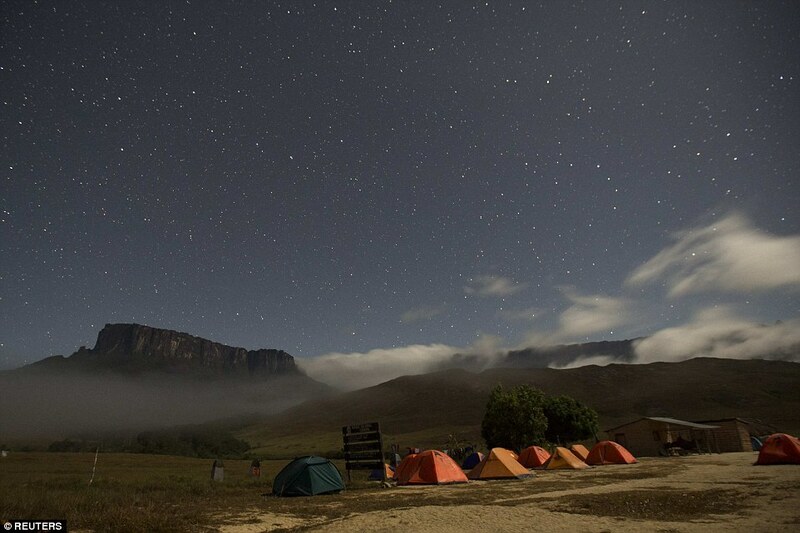 Once impenetrable to all but the Pemon indigenous people, thousands of hikers a year now make the trek across savannah, through rivers, under a waterfall and along a narrow path scaling the cliffs of Mount Roraima. 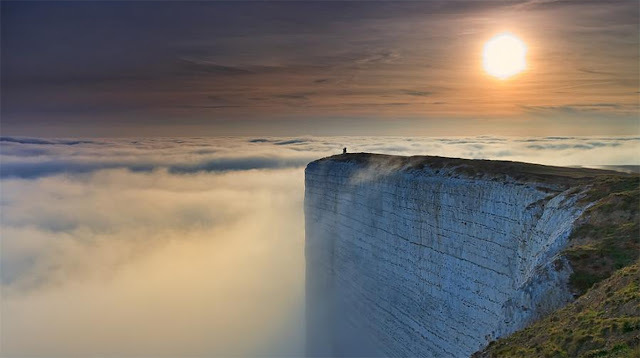 Its 31 km2 summit area is bounded on all sides by cliffs rising 400 metres. 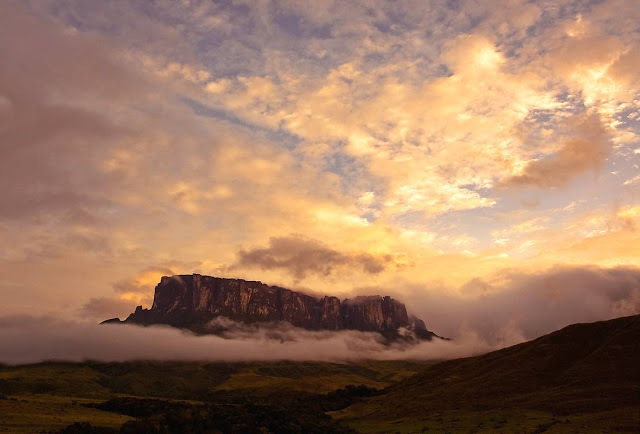 The mountain also serves as the triple border point of Venezuela (85% of its territory), Guyana (10%) and Brazil (5%). The throngs are a boon to Venezuela's tottering tourism industry; they also scatter a prehistoric landscape with unwanted litter and strain a delicate ecosystem. Mount Roraima lies on the Guiana Shield in the southeastern corner of Venezuela's forming the highest peak of Guyana's Highland Range. 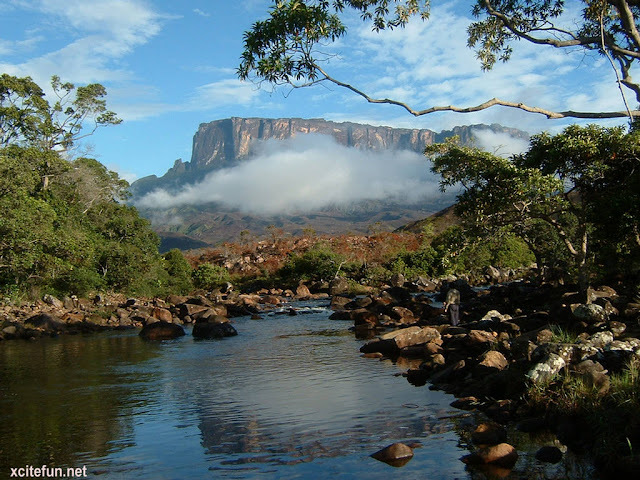 Mount Roraima Top Park is considered some of the oldest geological formations on Earth, as much as two billion years ago in the Precambrian. It's an exotic, faraway destination so it's both very costly and very attractive, have the peaceful aura appropriate to one of the Earth's most ancient formations. 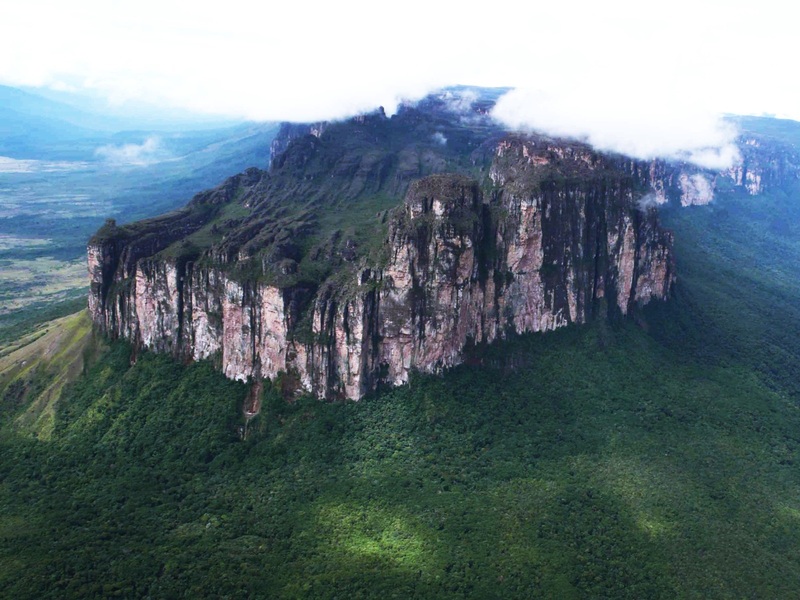 Although the steep sides of the plateau make it difficult to access, it was the first recorded major tepui to be climbed: Sir Everard im Thurn walked up a forested ramp in December 1884 to scale the plateau. This is the same route hikers take nowadays. The only non-technical route to the top is the Paraitepui route from Venezuela; any other approach will involve climbing gear. 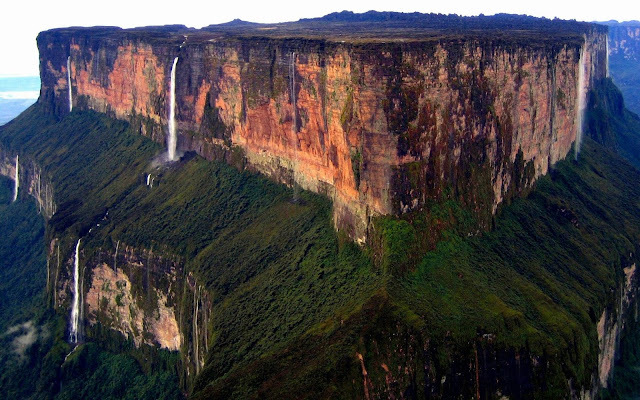 The highest point in Guyana and the highest point of the Brazilian state of Roraima lie on the plateau, but Venezuela and Brazil have higher mountains elsewhere. Mount Roraima, a natural border between three South American countries, offer such breathtaking views that they might just stick with you forever and ever down in some rusty memory box. This spot is about unconventional traveling ideas, a place where people can find unworldly landscapes and a new way of seeing things. And this is definitely one of them. Moreover, almost daily rains have also created an exclusive ecosystem which includes a number of endemic species, black frogs, dragonflies, tarantulas and such as a unique carnivorous pitcher plant, clinging to cracks and crevasses and some of the highest waterfalls in the world. 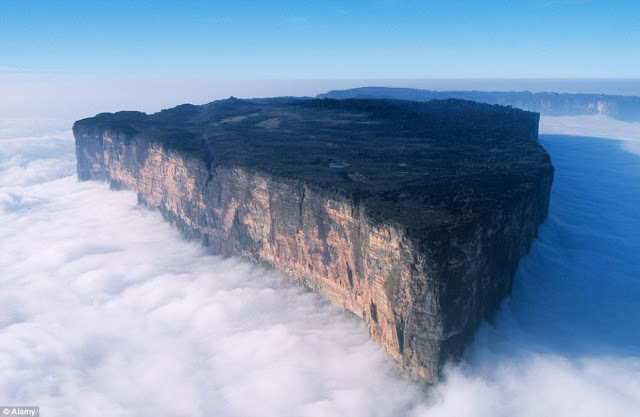 Mount Roraima was considered a symbol of these regions, an “axis mundi”, a massive tree within which all the vegetables and fruits of the world grow, tall cliff a place of mystery, myths for indigenous people used to live here from many centuries. Though, hiking is not hard here, can seek help from local peoples against some money. 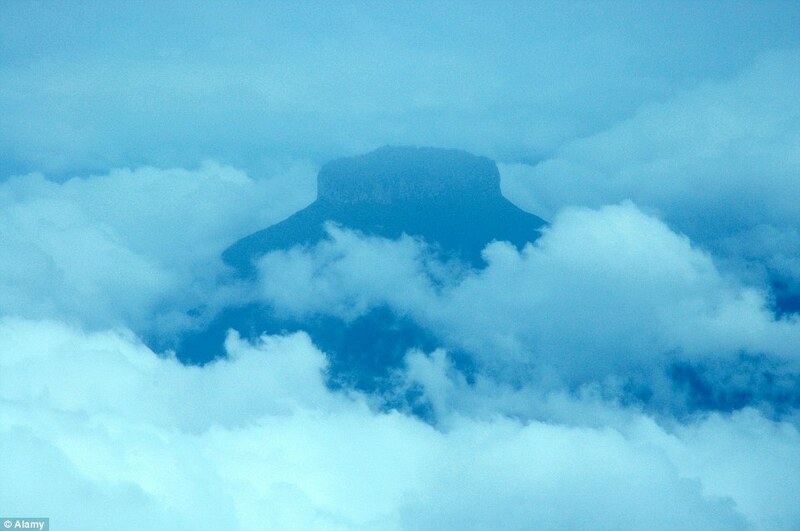 Mount Roraima is said to have some of the most captivating hiking trails in the world. This remote landscape of jungle and cliffs has inspired the dinosaur infested landscapes of Sir Arthur Conan Doyle’s novel The Lost World, and the dramatic waterfalls dubbed “Paradise Falls” in the 2009 Pixar film Up. 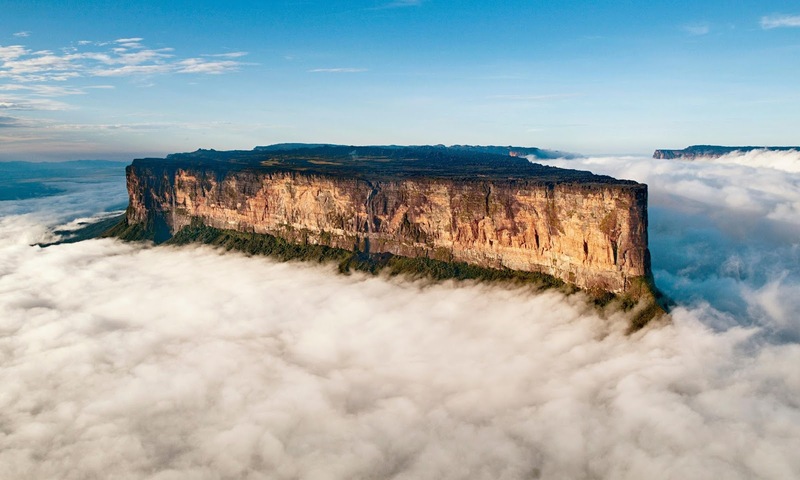 As the time progresses, Mount Roraima is getting popular among tourist, an average 3,000 and 4,000 people are climbing each year, up from hundreds a few years ago. That makes queues during peak times, and sometimes leaves the few sheltered coves at the top crammed with tents. On Mount Roraima's vast plateau strange & gnarled rocks formed when the African and American continents scraped apart, play with the mind, humorous in the sun, ghostly in the mist.